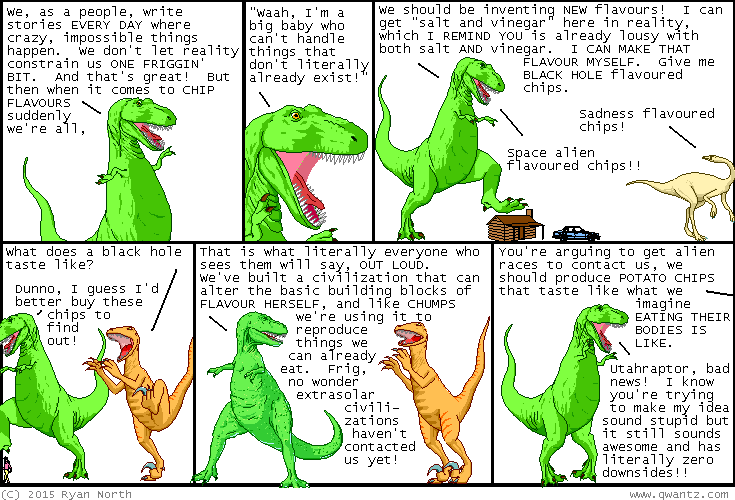 Dinosaur Comics - November 2nd, 2015 - awesome fun times! November 2nd, 2015: The last time I complained about food was in 2012, and within SIX MONTHS Soylent started up. Internet, I have but one request: PLEASE CONTINUE TO MAKE MY FEVERED FOOD DREAMS A FEVERED FOOD REALITY. One year ago today: going to space with the bloodskulls saves the earth from being gradually flooded in blood over several millenia. phew! !